County and state prison departments are improving their budgets, energy consumption and local image, all thanks to solar heating. With approximately 2,000 inmates on a 350-acre property, the maximum-security facility in Sullivan County used a lot of hot water. After tackling some of their electricity costs through better, more efficient lighting, the facility wanted to tackle its high hot water consumption. A solution was already waiting for them. In 2007, after close to two decades as an established plumbing company, Mann Plumbing and Solar of Bloomington thought solar hot water would be “a natural progression,” said Owner David Mann. When most people think of solar energy, they imagine solar photovoltaic cells, known as PV. Solar heating panels are different than PV cells, but all systems work on the basic principal of converting solar radiation, or sunlight, into heat. 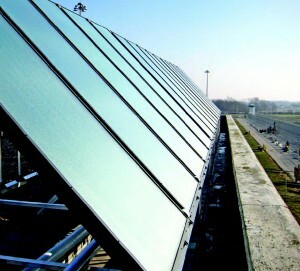 Solar water heating systems simply circulate liquid through rooftop panels heated by the sun. The liquid, which is typically either nontoxic glycol or water, transfers the heat to storage tanks that feed heated water into the conventional hot water system. Mann Plumbing and Solar decided to start with a pilot installation on the 200-inmate, 27,000-square-foot Block P one of five identical cell houses on one side of the property. Fifteen 4-by-10 Caleffi Hydronic Solutions panels preheat water for the inmates’ showers. After running through the array of panels, the water runs into a 55-gallon tank in the mechanical room, and then through a booster heater into the building’s original 700-gallon storage tank. A more efficient shower system was also installed to maximize the benefit of the solar heating installation. The project’s setting posed some challenges. All of the materials had to go through security, and “everything that you take in has to be itemized on a ledger sheet. They have to know every single piece and quantity,” Mann said. To minimize the time spent bringing materials through security, the materials were pre-manufactured and assembled at the shop and then reassembled on the roof at the facility. The installation itself was done in winter, using a crane to lift the concrete structure onto the two-story building’s roof. Eneref Institute, a leading research and advocacy organization in sustainable development, conducted a survey last year of the long-term performance of installed systems. The results verified that properly-designed solar heating systems can continue to operate and perform well for over twenty-five years – well past the payback period. Prior to the installation of the solar heating system, Wabash used only natural gas for heating water. Since all of the buildings’ natural gas usages were measured on the same meter, individual meters were attached to Block P and another identical cell house after the installation to measure the system’s success. For on-demand performance information, a Caleffi web-based monitoring system was also installed with the panels. Facility personnel were able to view the system’s performance online. Natural gas prices today are low. So, with a price tag of $70,000 and estimated savings of about $7,000 per year, the department of corrections estimated that the system will pay for itself within 10 years and then keep on saving. But payback period will be cut dramatically once natural gas prices rise, as Eneref Institute reported in March that they will do. Dagley admits that he had concerns before the project was installed. As the first correctional facility in the Midwest to use solar panels for heating water, Wabash Valley’s project attracted a lot of attention. Larsen says that local media coverage has been “very positive.” It’s been extensive, too, with stories by multiple newspapers and television stations. Public benefits from solar heating extend far beyond publicly-owned facilities. According to the Solar Energy Industries Association, the solar heating and cooling sector has produced a strong of return on investment for the public dollar. More than 90 percent of Americans want greater use of these technologies.